Landaas & Company newsletter September edition now available. Click here for our 2017 Investment Outlook video. 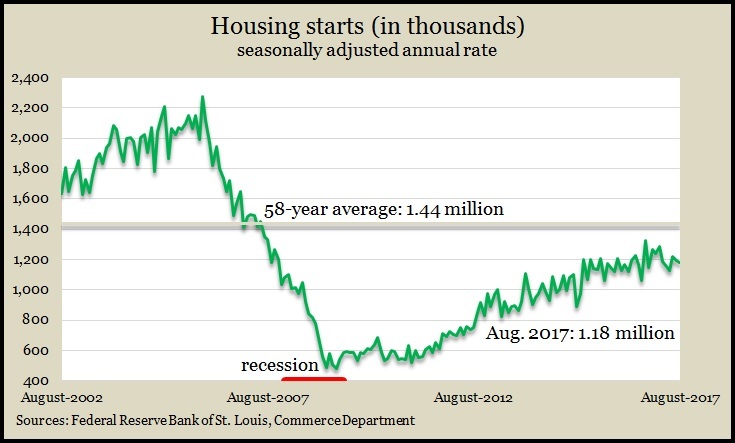 Home building continued to expand in August, although at a slightly slower pace, according to the Commerce Department. The annual rate of housing starts slipped 0.8% from July to 1.18 million houses. New single-family units started going up at the fourth-highest rate since the recession, but they’re still at less than half the peak pace in 2006. Housing economists say lack of new houses has helped drive up prices, making homeownership less affordable for more people. Sales of existing houses grew at a slower-than-expected pace in August, falling for the fourth time in five months. The National Association of Realtors reported an annual rate of 5.35 million houses selling in August, down 1.1% from July’s rate. The inventory of houses for sale fell 6.5% from the year before, marking the 27th consecutive decline in year-to-year supply. The median sale price rose 5.6% from August 2016, the 66th increase in a row. The trade group said hurricanes delayed sales in southeastern states and may boost transactions into 2018. Hurricanes Harvey and Irma continued to swell jobless applications as the moving four-week average for initial unemployment claims rose for the third week in a row. The year-to-year comparison rose for the second consecutive week, but the level remained 25% below the 50-year average, suggesting that employers continue to be reluctant to let workers go, which strengthens the job market and raises confidence for consumer spending. The index of leading economic indicators rose 0.4% in August, following a 0.3% gain in July. The Conference Board said its index showed broad support across the economy for continued moderate growth with prospects for slightly increasing momentum. The business research group said the yield spread, consumer expectations and new factory orders helped raise the index while unemployment claims – affected by Gulf Coast hurricanes – were a drag.